Checking the latest ECMWF model, things have changed radically. We had mentioned that things are ripe, especially if you have read Huntington's posts. However, the models had not been picking it up. Well, they have now, especially the EC model which is showing one storm after the next, starting around noon tomorrow, for the next 10 days. Snow elevations should not be a problem as these storms look to deliver around the 7,000 foot mark and below. Of course some lower mountain rain could occur west of Lake Tahoe, but Rose should be all snow. As you can clearly see, we are moving into a very wet period and a not a second too soon. 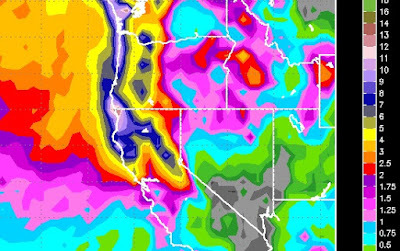 Slide Mountain is being forecast to pick up between 4-6 inches of liquid in the next 10 days. That could translate into 4+ feet of snow and I am fairly confident that it is going to happen. Again, some higher elevations west and north of the lake are looking at nearly 10 feet of snow. Now that my friends, is a Sierra storm. For you Thanksgiving travelers, I will post updates on the when these storms will hit. They will definitely have an impact on travel over Donner to California and back. They will also be packing some winds for the leeward side of the Carson Range.